Volunteers are needed throughout the season for leaf raking, storm debris clean-up, and general park maintenance. Clean-ups will be scheduled in the spring and fall, but large groups interested in this activity may also set-up their own outing. This is an excellent opportunity for organized groups, families, and students. A few times throughout the season, we like to gather our friends to help clean-up the park. Regular park clean-ups help maintain the park grounds, and ensure that all visitors have an enjoyable and safe experience during their visit to the park. Follow us on Facebook and Twitter, or sign-up for our newsletter to receive more information and scheduled dates and times of these park clean-up events. Caponi Art Park is looking for groups that could be contacted to help clean-up after damaging storms to ensure the safety of visitors and to maintain the beauty of the park. Groups will be contacted immediately after a damaging storm to help gather and remove debris around the park. This volunteer opportunity is perfect for those with flexible schedules and the drive and determination to get a large project done in a short amount of time. Gardeners will work on a variety of projects from planting flowers and trees, to weeding and watering under the direction of a staff member or an experienced volunteer. Experience is not necessary, just a love of nature and a drive to learn. Ongoing and single event opportunities are available for individuals and groups from May-October. The Volunteer Head Gardener position is ideal for an individual with a passion for the outdoors and gardening. This position will be an integral part of the Caponi Art Park team, helping to plan, care for, and maintain park grounds. They will also spend time working with less-experienced park volunteers, ensuring that proper gardening techniques are used consistently. The Head Gardener will ideally be able to volunteer on a regular basis at Caponi Art Park. Assist in Maintenance of park gardens, pathways, and landscaping. Work alongside other outdoor volunteers, encouraging consistent gardening techniques. Generate an ongoing list of pertinent gardening projects and grounds maintenance task; this list will serve as a guide for other park gardening volunteers. The Gardening Assistant may volunteer on a regular or part time basis under the direction of a staff member or experienced gardening volunteer. Activities: planting, weeding, and watering flowers and plants in the Sculpture Garden and Theater in the Woods. Volunteers are essential to the atmosphere and execution of arts and cultural events at Caponi Art Park; we simply could not offer these programs without our volunteers. Get involved with one of our family-friendly outdoor programs including Summer Performance Series, Special Events/Performances, Fall Fest and the Medieval Fair. Come join us as we enjoy these events within the beautiful embrace of nature. Activities may include, greeting, directing and collecting donations from visitors, answering general park and program questions, assisting staff or artists with set-up and clean-up, and making popcorn. The best part is you can stay and enjoy the program! 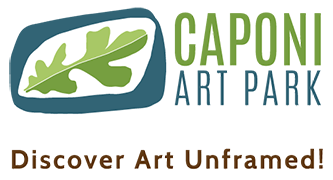 Volunteering at Caponi Art Park is perfect for that one-time or summer-long volunteer opportunity. Sign up to receive information about volunteer opportunities for the specific events.